Rewind to November 2017. I was just about to head to the airport to leave Florida after a fun work trip at Walt Disney World. I get a call on my phone from none other than Ashley Eckstein, the founder of Her Universe, a fashion and lifestyle brand for fangirls. I was working for Ashley at the time as a digital media producer at Her Universe and she knew that I was a huge Star Wars fan. When I picked up the phone she said, "Hey I know you're heading to the airport, but I really need you to help me design a collection to celebrate the 10th anniversary of The Clone Wars. Oh, by the way I need it tomorrow." I almost dropped my phone out of pure shock. Star Wars: The Clone Wars is the reason I became a Star Wars fan. It's the reason why I'm writing this blog today and why I'm so lucky to be a part of the Star Wars fan community. I couldn't believe this was actually happening. When I got to the airport, I bought a notebook and pen at the nearest store because I didn't have one with me and I furiously started to write down ideas. I'm no designer, but I know these characters and their costumes like the back of my hand so I got to work! Fast forward to today. 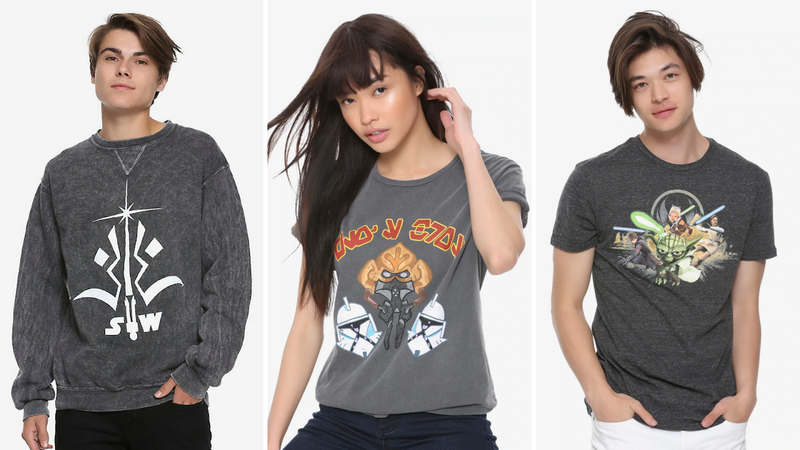 The Clone Wars fashion collection just launched at Her Universe and I couldn't be more proud of what Ashley and her team of designers have done. It's available this week at San Diego Comic Con and some of the pieces are already online to buy. Let's take a look! The fashion collection includes a Captain Rex moto jacket, Obi-Wan Kenobi longline tunic, Ahsoka Tano dress and coordinating scarf, Padmé Amidala blazer, a Darth Maul track jacket, Asajj Ventress activewear set, and an Anakin Skywalker pullover sweatshirt. 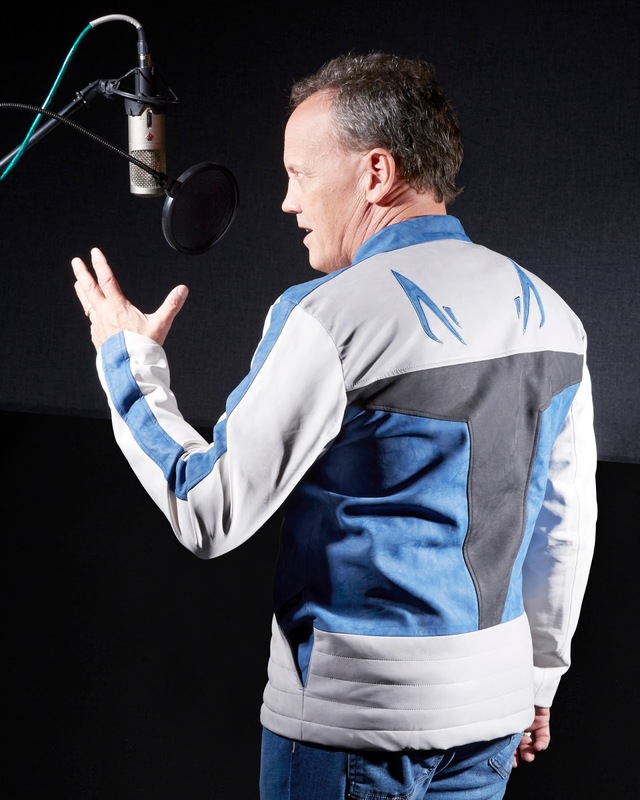 As you can see above, Ashley managed to get the gang back together and each piece is modeled by the character's voice actor- Dee Bradley Baker (Rex), James Arnold Taylor (Obi-Wan), Ashley Eckstein (Ahsoka), Catherine Taber (Padmé), Sam Witwer (Darth Maul), and Matt Lanter (Anakin). My favorite piece of the collection is the Ahsoka Dress. Inspired by her costume from Season 3 and beyond, it features the keyhole neckline, open back detailing, and a faux-suede panel. There's also a coordinating Ahsoka Scarf that looks just like her montrals. This dress also comes in plus sizes! 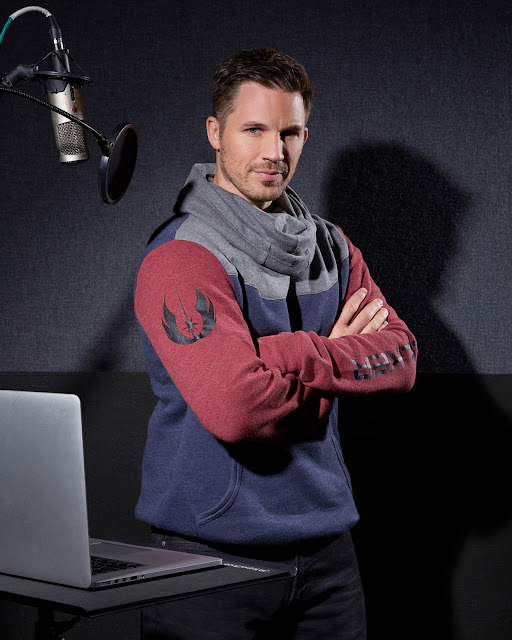 Next is another one of my favorite pieces because it looks so cozy- the Anakin Skywalker Pullover Sweatshirt. This piece was inspired by Anakin's costume from the early seasons of Star Wars: The Clone Wars when he still wore armor over his Jedi tunic. The right shoulder features the Jedi crest and the left sleeve says "Skywalker" down the arm. It has kangaroo pockets in the front and a cowl-neck hood detail. I can't wait to get this and style it for fall! You can't have a Clone Wars collection without featuring Padmé! This Padmé Amidala Blazer is the perfect expression of subtle geek fashion. It resembles the coat Padmé wears in the early seasons of The Clone Wars in a more every day style. The blazer features a printed bodice and solid colored sleeves. 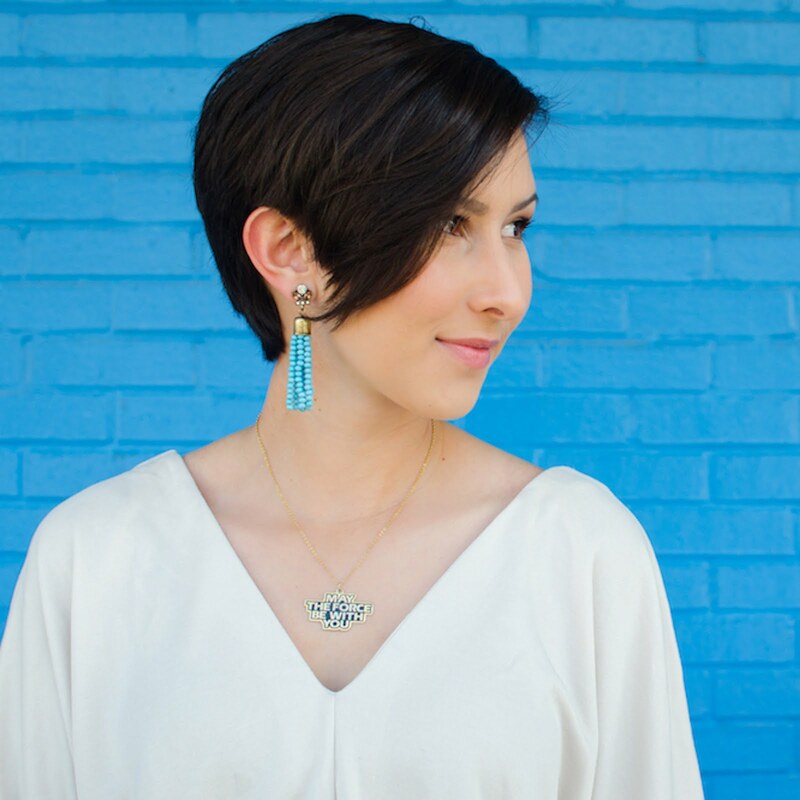 Catherine Taber is stunning in this piece! 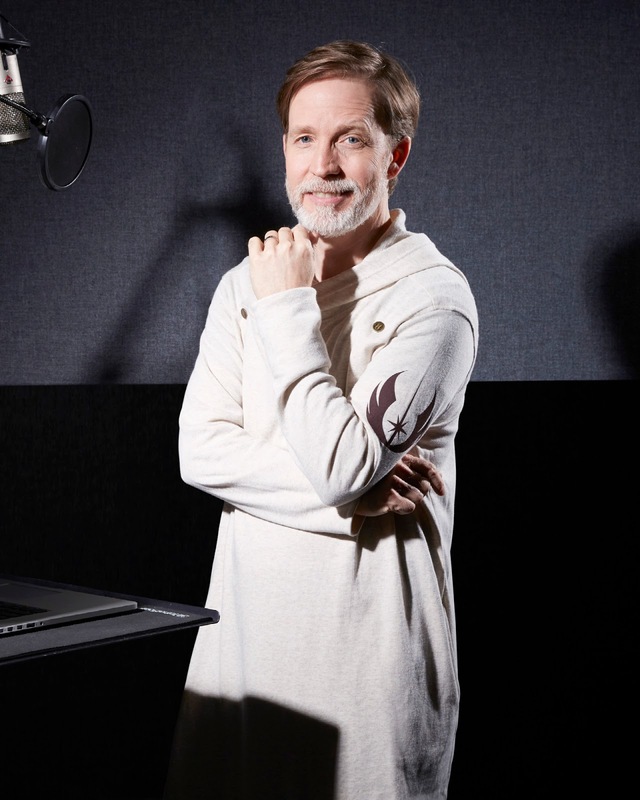 Obi-Wan is my favorite Jedi because he's so refined and classy, just like this Obi-Wan Kenobi Longline Tunic! The cream-colored long hooded sweatshirt is perfect for brisk days when you just want to cozy up in a soft sweater. It features the Jedi crest on the shoulder and metal snaps at the front so you can secure the wrap. I think this is a great item for men to wear in cool weather and I can totally see women styling this as a long dress. My favorite part about The Clone Wars was all of the different clone troopers. They each had their own unique personalities and one of the stars of the show was Captain Rex- leader of Anakin Skywalker's clone battalion. This Captain Rex Moto Jacket features all of the elements that make Rex's armor so special. The front resembles his armor with hashmarks along the chest. The back looks just like his helmet with the T-visor and his infamous blue jaig eyes. I love that I wanted a Darth Maul piece in this collection not even knowing that he would return in Solo: A Star Wars Story! 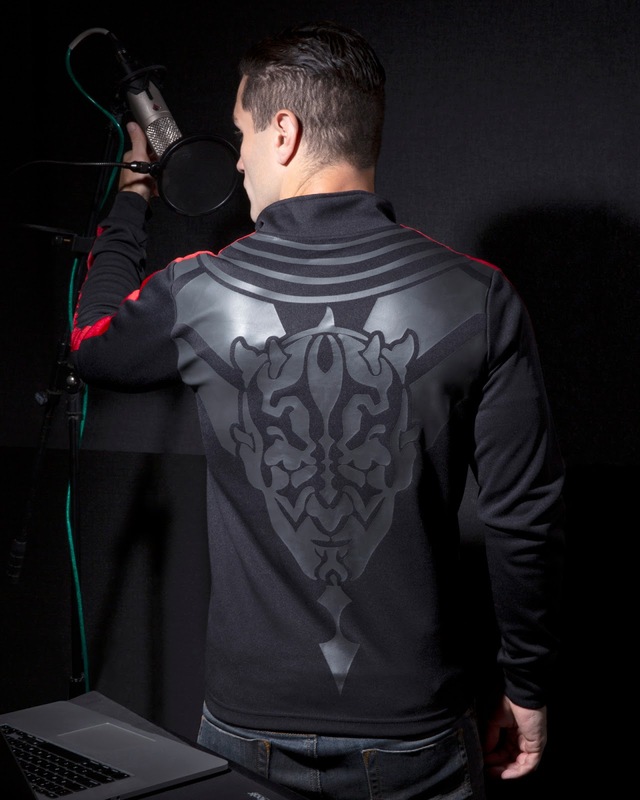 This Darth Maul Track Jacket was inspired by Maul's costume after he get his shiny new cybernetic legs. The front shows off his striking chest tattoos and the back features the menacing Dathomirian himself. There is also an Asajj Ventress Activewear Set coming soon for women! Attendees of the Her Universe Fashion Show at San Diego Comic Con will be the first to see this stunning outfit. The collection also includes an assortment of T-shirts featuring some of my favorite artwork. 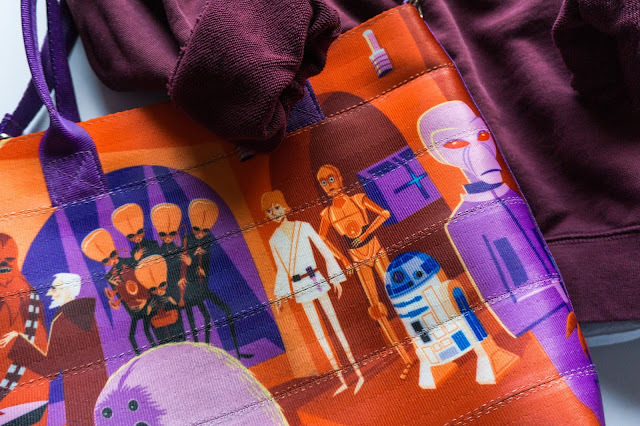 The Star Wars: The Clone Wars Pullover Sweatshirt features a logo that all OG Her Universe fans will recognize. When Her Universe was in it's early years, this logo was on every single piece of Star Wars clothing they offered. It shows off Ahsoka Tano's face tattoos and lightsaber with the letters "SW" for Star Wars. This logo holds a very special place in my heart! The Plo's Bros T-shirt is definitely my new favorite shirt. This artwork was seen in The Clone Wars on the gunship that served Plo Koon's battalion. The Aurebesh writing literally says "Plo's Bros". I can't wait to own this and style it! You can't forget Yoda in The Clone Wars! This Yoda Group T-shirt features all our favorite heroes from the show including Anakin, Ahsoka, Obi-Wan and of course, Yoda. 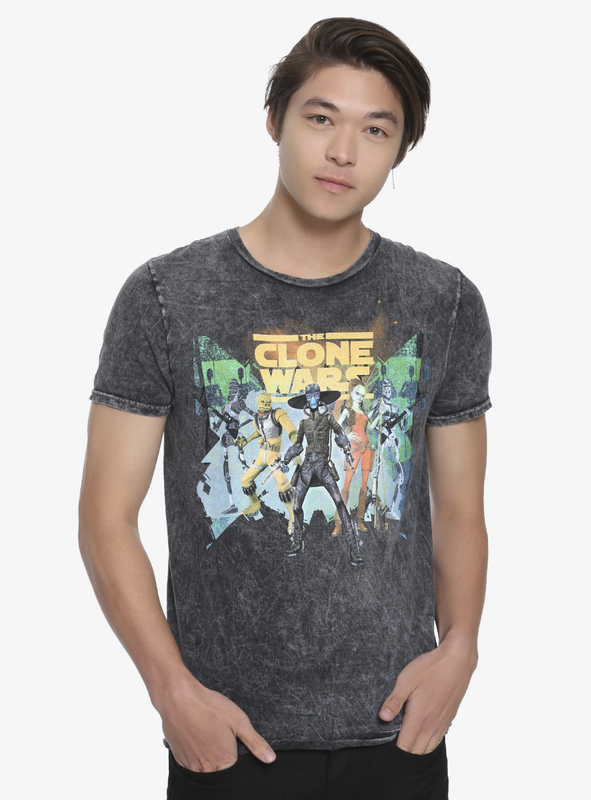 Last but definitely not least, The Clone Wars Bounty Hunter T-shirt is enough to make me cry! I specifically requested a shirt featuring Cad Bane in this collection because his character is the reason why I fell head over heels for The Clone Wars. Thankfully, this shirt made it through the final round of approvals and it's even better than I could have imagined. It features Cad Bane front and center with Aurra Sing, Bossk, IG-88 and IG-86. I'm definitely buying two of these shirts! The collection will be available this week at San Diego Comic Con and all of the pieces will be online at HerUniverse.com very soon. Happy 10th anniversary to all of the cast and crew that created Star Wars: The Clone Wars. This show truly means the world to me and I'm so happy we all get to wear our hearts on our sleeves with this new collection!